Thermoplastic polyolefin is a single-ply roofing membrane known for affordability but also for inconsistent quality from brand to brand. Cost ranges from $6.50 to $12.00 per square foot, and cheap TPO should be avoided. This roofing guide explains this TPO roofing material, its strengths and weaknesses and TPO roofing cost. TPO is one of the best flat roof materials but can also be used on other types of residential roofs. TPO is known as a single-ply roofing because it is installed in one layer, unlike a BUR roof composed of layers of asphalt and gravel. However, the single membrane is composed of fused layers of material. A thermoplastic polyolefin base layer is covered in scrim fabric such as fiberglass or polyester for reinforcing strength. Finally, a topcoat of TPO is applied. Thicknesses from 45mil to 90mil are available, and the thicker materials generally last longer. TPO’s name is misleading since a TPO roof membrane doesn’t contain plastic. Instead, the thermoplastic component is typically made from blends of polypropylene and ethylene rubber with reinforcing fillers. When seams are heated, the material becomes plastic. In this context, it means the TPO is moldable and will fuse easily. Why are TPO roofing systems a popular choice for many flat roof systems? Lets’ take a look at both the pros and the cons of this flat roof material. 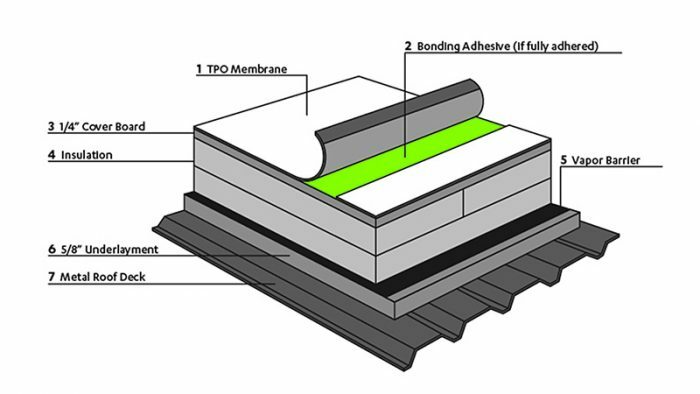 TPO is among the most affordable single-layer membrane roofing. It can be used on residential and commercial roofs, either steep slope or low slope/flat roof. The seams are welded with hot air and stay together up to four times better than glued and taped seams. TPO resists tearing and punctures. It’s lightweight, easy to work with and can be glued, fastened or ballasted to secure it to the roof deck. TPO can also be installed directly on some other roof materials and rigid insulation. This might prevent the extra cost of a roof tear-off. Insulation made by the same brand should be used with the TPO to prevent voiding the warranty. TPO is resistant to the weakening effects of UV radiation. Note: Much TPO information online contains old warnings from the Midwest Roofing Contractors Association (MRCA) saying TPO breaks down quickly in very warm climates. The warning was widely reported and remains in many online lists of TPO pros and cons. However, the warning was from 2010. Today’s TPOs are improved from the formulations in use at that time. The MRCA no longer warns that high heat damages TPO. The nature of the material means dust and light debris generally blow off in light wind or wash away with rain or when lightly rinsed with a hose. TPO resists mold and algae too. The MRCA noted in its 2017 annual report that dust from haboobs in the Phoenix area remained on PVC roofs and required cleaning, but not on TPO. TPO in white and tan is reflective material listed as cool roofing by the Cool Roof Rating Council and Energy Star. It also meets California Title-24 requirements for energy-efficient roofing. Studies suggests TPO can reduce energy use and cost by about 30% over asphalt roofing. The material is recyclable. Better TPO materials come with warranties of at least 20 years. There’s plenty to like about this single-membrane roofing, but be cautious too. Here are the concerns. There is no set “recipe” for TPO, and formulations continue to change. For example, fillers are used in the material, but which fillers are included varies from product to product. The fillers are designed for structural reinforcement and include fiberglass, carbon fiber, metal oxy sulfate and talc. The inconsistent formulations result in varying degrees of quality and durability. As noted, TPO has several layers. The layers of poorly manufactured TPO materials can bubble and come apart. Thickness of the material has little to do with how well it stays together. When layers of a roofing material expand and shrink at different rates when heating and cooling, these are the results. Crazing are hairline cracks in the surface that don’t immediately affect strength. Cracks allow leaks. Materials are made in widths from 6’ to 10’, so your roof will have seams. However, they aren’t highly visible or unattractive. EverGuard Extreme was the most durable TPO in an accelerated aging test conducted by Structural Research Inc (SRI). The three other brands followed in order. The results were widely reported including by Commercial Construction & Renovation. These brands and others are shown to exceed minimum ASTM D6878 standards. This is a challenging issue for TPO because the current products have been on the market for just five to ten years. There’s no track record. Early TPO products lasted 10-15 years. With advancements made in current TPO roofing, you can expect durability of 18-25 years before repairs become major and the cost of repairing outweighs the cost of replacing your roof. Roofing a home or commercial building with TPO single membrane roofing will cost $6.50 to $12.00 per square foot, with about $9.00 being average. Check out our flat roof replacement cost post for comparisons with other flat roof options. This breaks down to about $3.00 to $5.50 per square foot for material and $3.50 to $6.50 for installation labor. Roof size: Larger roofs have a lower cost per square foot. Roof type: A TPO flat roof costs less to roof than steep-slope roofs. Roof complexity: The more HVAC equipment, dormers, vents and other obstructions present on the roof, the higher the cost. Quality of the material: The best long-term value comes from using high-quality TPO, even though it costs more upfront. Since TPO has become so popular in recent years, inexperienced contractors are getting into the installation game. To avoid TPO roofing problems make sure the installer you choose has years of experience. Ask for references for roofs installed 5-10 years ago, and ask those references how the roof is holding up. Should you need a TPO roof repair you should also contact an experienced professional. If you’d like help finding an experienced TPO contractor with proper licensing and insurance, our Free Estimate service is free and obligation-free too. You can also read more about flat roof repair cost here.